If you’re headed to Disneyland this Halloween season, you’ll want to check out the Halloween Time celebrations happening at the Disneyland Resort Hotels. 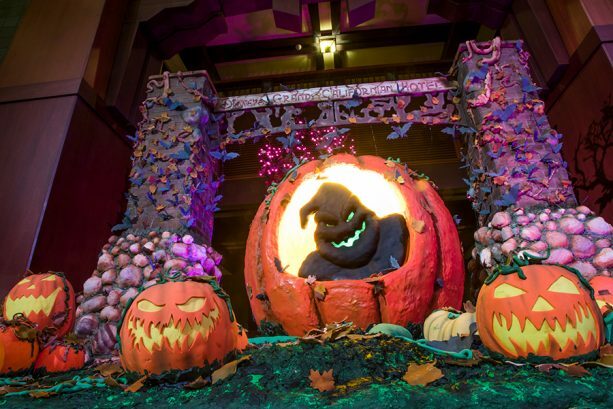 Guests at the Disney Grand Californian Hotel and Spa will find a lobby decorated for the season with an edible display of Halloween pumpkins. The pastry chefs at the hotel used 200 pounds of icing, 100 pounds of chocolate, and 300 pounds of fondant to create the displays. The Disneyland Hotel and Paradise Pier Hotel are also decorated for the holiday! On select afternoons from October 2 through October 31, guests at the three Disneyland Hotels can trick-or-treat at all three of hotels. Maps will be available for little ones and their parents. Guests should sign up at the hotel front desk for this activity. Other activities include cookie decorating kits (for a fee) and other crafts. Guests at Disney’s Grand Californian Hotel will find a Halloween treat cart in the lobby selling all kinds of Halloween sweets including cookies, pretzel rods, whoopie pies, and more. The Coffee House at the Disneyland Hotel is serving up a Bat Cookie, all three hotels have the Poison Apple Glow Cube, and Pumpkin Spice Lattes can be found at Surfside Lounge at Disney’s Paradise Pier Hotel, and Pumpkin Muffins at The Coffee House.